When it comes to online maps, there is a gap between the 2-D maps and pictures you see on Google Maps, Live Maps, and Yahoo Maps, and the more fully-immersive, fly-through experiences of Google Earth and Virtual Earth. A small four-person startup in New York City called UpNext is trying to bridge that gap, by bringing extremely detailed, 3-D maps to the browser. UpNext only maps Manhattan right now (they hope to add Boston and San Francisco next spring), but it is a powerful demonstration of how 3-D experiences could soon become more mainstream. (No download is necessary, but you do need Java 1.5—and be warned that older Macs might have some issues with it). I met UpNext chief architect Raj Advani last week at our Boston MeetUp, and he came by today with CEO Danny Moon to show me the site and its new Facebook app. 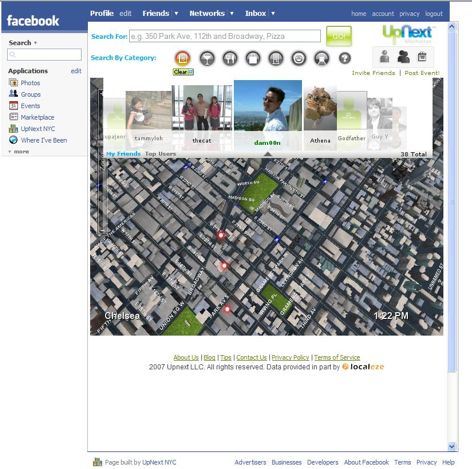 Yesterday, UpNext launched its map on Facebook, although it is not yet in the app directory. (Unlike many Facebook apps, it is not a subset of the main site’s functionality. You can do everything inside Facebook you can on UpNext.com.) 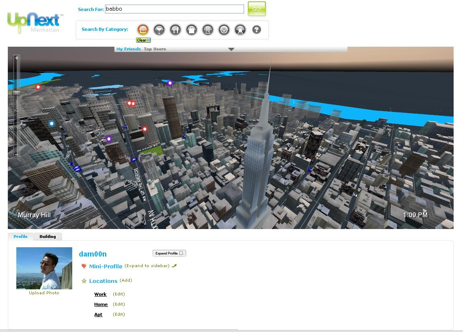 UpNext is a complete 3-D representation of the city, down to practically every single building. You can pan and zoom, and click on any building to get a list of the businesses inside. Type in an address and the map flies right to it. If you want to see nearby restaurants, bars, stores, hotels, museums, or sports facilities, you can set a filter to light those things up on the map. This building-by-building and category search “is something you cannot do on Google Maps,” claims Moon. For many businesses, UpNext pulls in ratings and reviews from other sites like CitySearch, the New York Times, and Time Out. 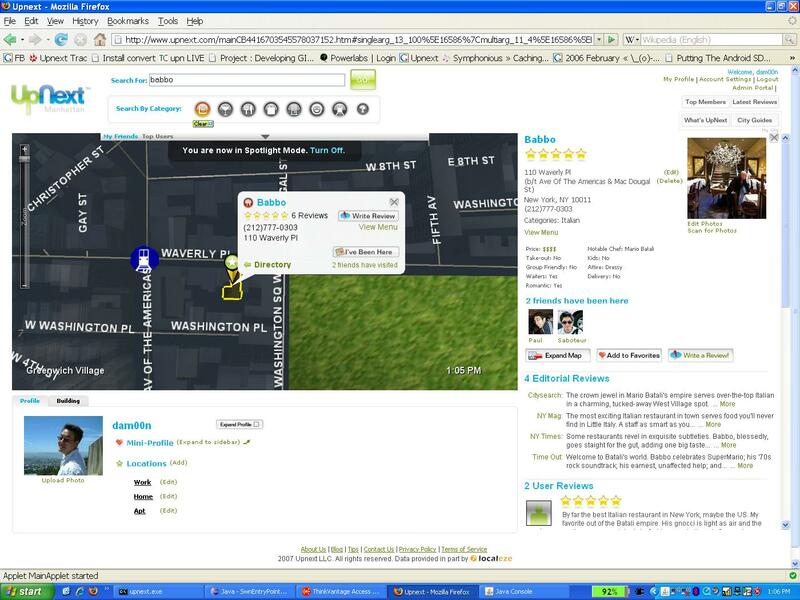 And you can add your own reviews, and look at all the places your friends on UpNext have rated, reviewed, and visited. That now includes all your New York City Facebook friends, whom you can import into the main site as well. They pop down in a friend slider that lets you sort through them and all the places they’ve rated. UpNext gets its map data from VisionMedia, which flies over the city taking pictures and then extrapolates the height of each building, allowing UpNext to render them in 3-D. It then takes local business information from Localeze, and drops it onto every building (which is geocoded using data from the City of New York). “We want to reach a new level of detail in immersive search,” says Advani, “so I can see at a glance where things are happening.” He’s even added day and night cycles to the map. All of this would not be possible using Ajax or even Flash, says Advani. Only Java lets UpNext tap into the video acceleration card on your PC to render the polygons fast enough. The trick is to compress each building, rendering it with as few polygons as possible. There is some lag time while you are waiting for Java to load, but that should be fixed in an update to Java coming in about three months. UpNext is a real bootstrap operation. The four employees put in $50,000 and pulled together another $45,000 from friends and family, which was enough to create the map of New York City. Now they want to raise about $1 million to expand to other cities. In terms of making money, at some point they will turn on local search ads as well as in-map ads where buildings light up during certain searches (like for “shoes”). Moon also envisions creatiev banner ads linked to the map. “If Starbucks is launching a new drink,” he suggetss, “all the Starbucks could light up if you click on the ad.” Local business Yellow Pages-type ads are another natural fit. In reality, though, UpNext is a technology demo waiting to be picked up by a larger company building out a global mapping platform. It cannot survive as a standalone company given the competition. Google, Yahoo, or Microsoft should buy these guys and blow out these maps worldwide.